Is There Any Environment On Earth That Spiders Can't Live In? They can cartwheel their way through the desert, snag themselves a live fish twice their size, and trick prey by carefully constructed giant spider effigies (made out of leaves, dead bugs, and nightmares). Is there anywhere spiders can't thrive? 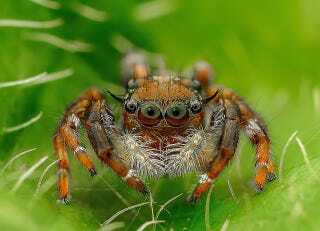 Spiders are found in almost every terrestrial habitat on earth. They are able to run around on glaciers, and forage in some of the hottest deserts on earth. A dune burrowing spider (in the family Eresidae) in the Namib desert has been recorded to actively forage in webs in 65 C (that's 149 F)! They are on all continents with the exception of Antarctica, where acari (mites) are abundant. There's even a spider (in the family Desidae) that lives in the intertidal and hides in shells, sealing off the opening of the shell with silk and bobbing around until the tide goes back out. One of my all time favorites is the impailing spider Doryonychus raptor - only found at the base of high waterfalls in Kauai. It hangs under leaves and stabs flying prey from mid air. Then there is the Bolas spider that hangs silk lines with a glue droplet at the end that is infused with moth pheromones. It lures in male moths "lasso's" them by slapping them with the glue droplet, and reels them in. I'm also a big fan of Scytodes spiders that spit glue on their prey to tether them down. It's a delight for me to see any of these in the field - makes me feel lucky that they live on earth with me at this time. They also have a lot that that we can learn from them - like, what's in that glue? What are the biomechanics that allow them to move so quickly in response to rapidly moving prey? You can read Binford's full Q&A — including some ways that we may end up using spider venom for own use and a theory about what it is that makes so many people afraid of spiders — right here.